Mainly pictures I know but I would just like to touch on a year that was very special to me as I have made so many great friends and shared some fantastic experiences with many different people from all walks of life. It really is amazing what can be achieved in a single year if you putÂ your mind to it from relationships with motel owners, travel companies, store owners and most of all building friendships with clientele from all over the world. I try very hard not to just take someone trout fishing but take them on a tour that involves great scenery, great food, lots of humour, relationship building between family and friends, introduction to a new sport that they may use again and of coarse hopefully we have a great day with the fish that will keep you coming back time and time again. The most important thing that I need and want out of the day is to achieve and develop a new friendship so next time I have the privilege in taking you or your family fishing we are of to a great start straight away. It has been a rewarding year with plenty of clients in hard economic times which has kept me busy and not worrying about that so much which I must take my hat of to all that have kept me busy and using me as their preferred guide. The website has been fantastic for me and I get alot of satisfaction in writing reports and sticking all of your photo’s up so the world can see and so you have something to read at work as I know alot of you have those high stress under paid office jobs. 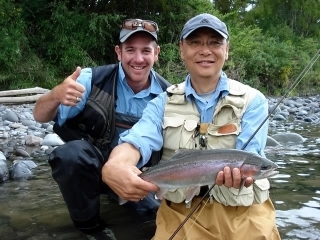 It is pleasure to write every Saturday for Tongariro River Motel and be apart of the most popular fishing report in New Zealand and also be able to refer people to Ross and Pip and know that they will be looked after while staying there. This coming year is looking promising and I look forward to the return of those of you that I have already met and made friends withÂ but also to those who are thinking of taking a guided fly fishing day to straighten any problemsÂ out or learn a new technique to fool the smartest of fish. Lets hope for settled weather in the next few weeks so we can truly reap the benifits of hot sticky days and see hard fighting fish riseÂ from the deep slowÂ pools to the surface, and gulp Cicadas all day long. Dont be silly and miss it so get to Taupo and add another memory to the list. Ok have just come in from spending half a day with Pete on the Tongariro and you should all know we have started the year well with a awesome fish for this time of year from the Upper Birch pool. This fish was the best of 4 fish hooked using small rubber legged hares ears with green flash in the back. Have a look at it,Â it’s a fantastic 4lb Rainbow that I would like to catch in the height of winter spawning runs let alone hard summer conditions. Lets hope the luck continues over the next few days and we see a few more like this. Well done Pete that was a very rewarding session for both of us I think. I wish you all well in the new year and hope that it becomes a prosperous one for you and your family.